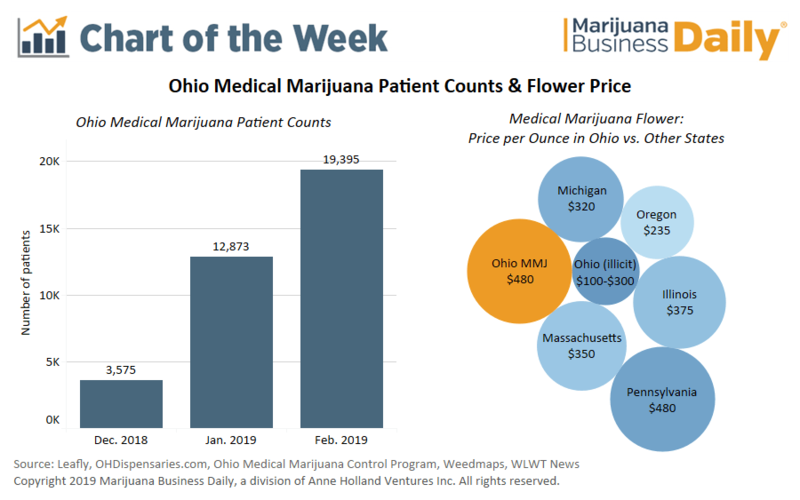 Ohio’s medical cannabis sales are off to a healthy start, garnering $1.85 million in under two months, but high prices and limited access to dispensaries have restricted patient participation. Since sales began Jan. 16, the state’s medical marijuana dispensaries have averaged $248,000 in weekly sales – a strong launch to a market estimated to net $300 million to $500 million annually when mature – but only 28% of registered patients have visited a dispensary. Of the 19,395 who have signed up since the registry opened Dec. 3, only 5,465 unique patients have made a medical marijuana purchase. This may be related to sales starting with only four dispensaries. Although nine dispensaries are now open, limited geographic distribution persists. Another well-cited factor keeping patients away: high prices. The average price in Ohio has hovered at $480 per ounce – substantially higher than per-ounce medical prices in bordering Michigan. 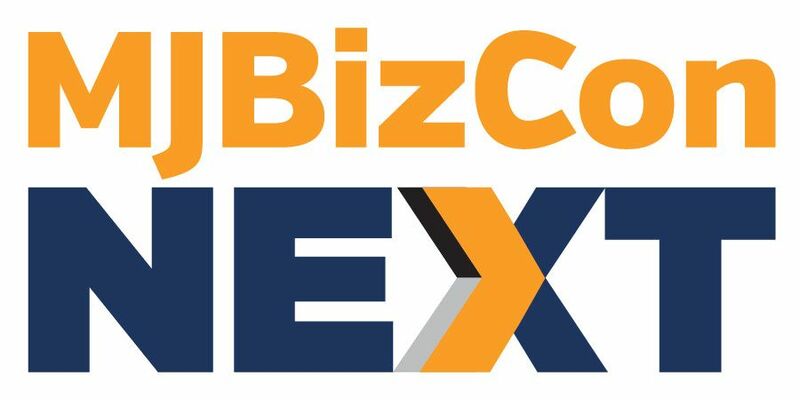 A Marijuana Business Daily analysis of pre-tax pricing found medical marijuana flower averaged $320 per ounce in Michigan dispensaries near the Ohio border during the first week of March 2019. The considerably lower prices and the state’s reciprocity program are driving the trend of Ohio patients traveling across the border to purchase medical cannabis in Michigan despite the legal risks involved. Current high costs stem, in part, from supply constraints, common in new and developing markets as cultivators come online. Prices in Ohio are likely to come down as the market matures. Medical flower prices in Oregon – which faces downward pressure from oversupply and competition from a thriving adult-use program – are in the same price range as Ohio’s illicit market. Initial sales in Ohio were restricted to flower for vaping as the state did not issue a certificate of operation to a processor until early March. The Ohio Medical Marijuana Control Program (OMMCP) now reports 38 processors have been issued provisional licenses and are awaiting certificates of operation. As of March 7, the OMMCP had issued certificates of operation to 16 cultivators, nine dispensaries and three testing labs. Physician buy-in has been robust, with 413 registered physicians providing 22,276 medical marijuana recommendations by March 7. This is the problem with New Jersey medicinal marijuana program. With the cost of one once of medicine over $500 dollars. The cannabis has very little medicinal value with THC levels hovering around .800 and CBD .020. If your lucky you may find a strain with 1.00 which still has no medicinal value. In New Jersey your paying for the smell and underdeveloped buds. As for those on SSDI and low income has priced us out if the program altogether. Since the medical visitation every 3 months for the doctor to keep your certification current runs around $150.00 to $300.00 dollars cash a visit. No discounts on pricing for these visits as they are not covered by insurance. New Jersey medicinal marijuana doctors exploit their patients in the program too fattening their pockets. Dispensaries are the biggest joke as they just want you to buy and get out. So New Jersey is a perfect example of everything thing that’s wrong with the program. As always the disabled and poor are priced out and once again looked on as a burden to society. And for New Jersey or any other state to substitute medicinal marijuana for addictive pain killers and pain relief. An Rx for pain meds is around $50.00 dollars with insurance and your doctor visit and Rx covered by insurance. Our the person that’s addicted to pain pills and turns to herion is not going to spend $500.00 for cannabis when they can spent the money on a whole lot of herion or pills. As a SSDI recipient and poor my rights to access to this program and medicine has been diminished. The word compassion has altogether been eliminated and substituted with exploitation of patients for financial gains. Vote your NJ politicians out of office. You’ve gotta wonder if Ohio & (my home-state of) Pennsylvania understand that….the concept of legalizing cannabis is to insure that income is diverted from the “black market”….to a “legitimate” market. You’ve also gotta wonder how a “legitimate” market expects to do, so…..when they’re charging (nearly) 50%, MORE, than the “black market”….and, who the actual “outlaws” are. With the 25% discount for Veterans, the $480.00 is reduced to the more reasonable $360.00. Still, better off utilizing Black Market for Kind Bud compared to dealing with Our Corrupt Government, Who is Enabling Big Pharma’s Prescription Drugs at Jacked up, Outrageous Prices. So much for Healthcare!